The Master of Public Health in Public Health Practice (MPH PHP) is a 42 credit, broad based, graduate-level public health degree designed for the full-time, working health program administrator, public health worker, or health care professional who is not planning an academic career, but who plans to continue working in the health care field. Participants in the Public Health Practice MPH Program seek to "be part of the solution" to our society's persistent health care problems. They will come from state health departments, managed care organizations, academic medical centers, municipal and country health departments, Veterans Administration health systems, school health programs, private not-for-profit community agencies, the medical profession, and many other settings. Because it is designed for the working professional, there is a 3 course cap per semester. Most students finish the degree in 3- 3 ½ years, taking 1-2 classes per semester. Click here for more information on the Online Master of Public Health in Public Health Practice. *applicable when you register after deadline; non-refundable unless course has been cancelled. The School of Public Health and Health Sciences is accredited by the Council on Education for Public Health (CEPH), the organization recognized by the US Department of Education to accredit public health schools. Any individual with a bachelor's degree or higher with a minimum undergraduate grade point average of 2.75 on a 4.0 grading scale from an accredited university and a minimum of three (3) years' experience in public health or health care is eligible to apply for admission. You must be currently employed in a public health or health care position or be enrolled in an accredited medical residency program. 1. Read application form instructions carefully. 2. Complete the UMass Amherst Graduate School Application under "Prospective Students." You can either apply online or download the application from there. 3. A personal statement is required and a minimum of two letters (typed) of recommendation are required from individuals best suited to assess the applicant's abilities. Please ask current employers, former supervisors and colleagues. 4. Request original official transcripts in duplicate from each college or university you have attended. 5. Official current (within 5 years) GRE scores (The GRE may be waived for those with a doctoral degree or its equivalent (Ph.D., M.D., D.D.S., JD.) from a regionally-accredited US institution. 6. If you are applying for Financial Aid, please fill out the FAFSA form at www.fafsa.ed.gov. 6. TOEFL* if applicable. (Please contact the Graduate School to see if this is applicable to you). (Click here for more information on TOEFL). 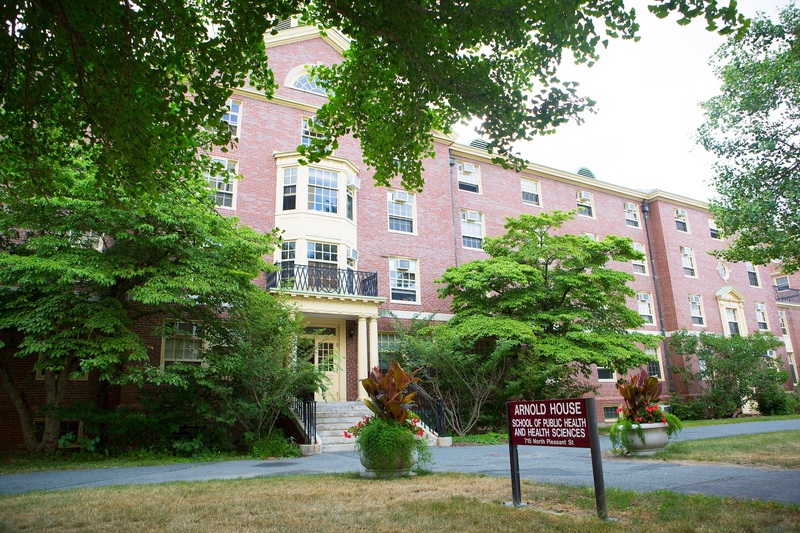 You can apply to the MPH program in Public Health Practice directly online or by requesting application material online at the Graduate School's website (Click here for application information and materials) or by writing the Graduate School, Goodell Building, University of Massachusetts, 140 Hicks Way, Amherst, MA 01003-9333, or by calling the University at (413) 545-0721. We encourage applicants to the PHP program to use both professional and academic references whenever possible, and to have their personal statements emphasize their current experience as a public health or health care professional. Availability of financial aid varies depending on matriculation and course status. Generally, if you are matriculated in a degree program and are enrolled in a minimum of 6 credits each semester, you may qualify for financial aid through the Free Application for Federal Student Aid (FAFSA) for U.S. citizens and eligible noncitizens. Please review our Financial Aid Checklist below. 1. Fill out the FAFSA form at www.fafsa.ed.gov. 2. It is important to list the University of Massachusetts Amherst school code number 002221. For the online MPH-PHP program, there are no scholarships, fellowships, grants or assistantships available through the program. "Excellent program! The broad spectrum of courses offered through the MPH-PHP program at UMass was very much in line with my career interests. As a fully accredited program it provided superb reinforcement/review of core skills, yet offered electives to bolster other areas of personal interest. Elective courses in Public Health Emergency Management, Health Care Organization and Administration, Health Care Finance, and Public Health Law each provided me with a very unique and focused look at certain aspects of our public health environment, and prepared me to provide leadership in these arenas." "The PHP courses were not only extremely interesting, but by and large, they provided me with new aptitudes that I could immediately apply in my career. " "The benefits of the distance learning program at UMASS were numerous. The education, while firmly rooted in the principles of public health, was skillfully delivered through real world scenarios, experiences, and with a "hands-on" approach. I was able to immediately utilize the tools I received from UMASS into my daily operations."